A perfect hike & kayak adventure! EL YUNQUE RAINFOREST & BIO BAY TOUR! Experience two of the greatest natural attractions in Puerto Rico! We teamed up with Fine Line Excursions to bring you the best of the East Coast. For a start, explore El Yunque Rainforest. 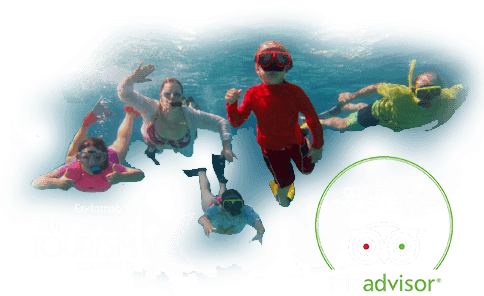 Next, discover bioluminescence at the Fajardo Bio Bay. Finally, SAVE BIG with this full-day package! The adventure starts at El Yunque Rainforest. First, visit El Portal Center. Hike the trails and refresh at the waterfalls. Have dinner at a Puerto Rican restaurant. Next stop: the Fajardo Bio Bay! Bioluminescence is one of planet Earth’s best-kept secrets. It consists of tiny organisms that make the water the glow at night. Yes, it’s great to see! This tour includes round trip transportation. Fine Line picks you up at your hotel in the morning and takes you back at night. 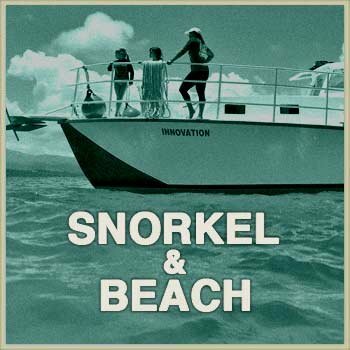 In conclusion, our El Yunque and Bio Bay Tour is simply a great deal! Enjoy Puerto Rico’s most popular nature attractions in a single day. Hike the trails of El Yunque Rainforest. 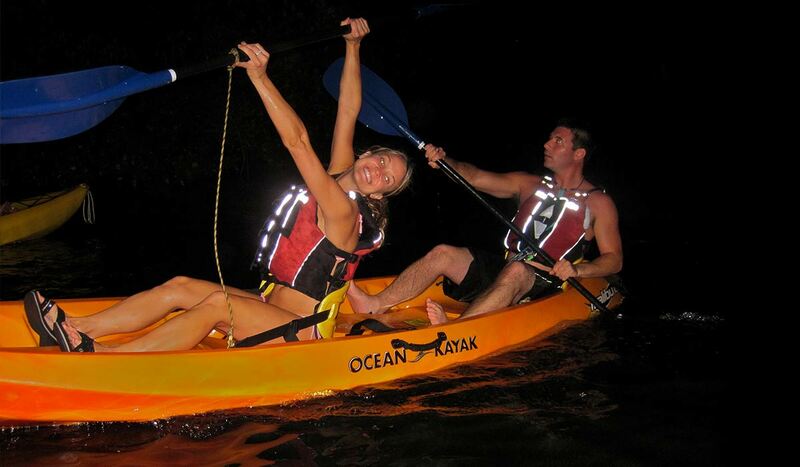 Go on a kayaking tour at night. Discover bioluminescence at the Fajardo Bio Bay. This tour includes round trip transportation*. Visit El Portal​ito​ Visitor Center (video, information, souvenirs). Hike to ​Angelito Trail (trail hiking, refreshing splash). Visit La Coca Falls (sightseeing, picture area). Dinner stop at a local restaurant (meal not included in tour price). Fajardo Bio Bay Kayak Tour. US Coast Guard approved life jacket. Low-intensity night time navigation lights. Training and safety instruction prior to the tour. Snacks: bottled water, fresh seasonal fruits, protein bars, and other treats. First aid and kayak towing equipment. * Round trip transportation and El Yunque Rainforest Excursion is provided by Fine Line Excursions. The Bio Bay Kayak Tour is provided by Kayaking Puerto Rico. Explore El Yunque Rainforest with Fine Line Excursions. 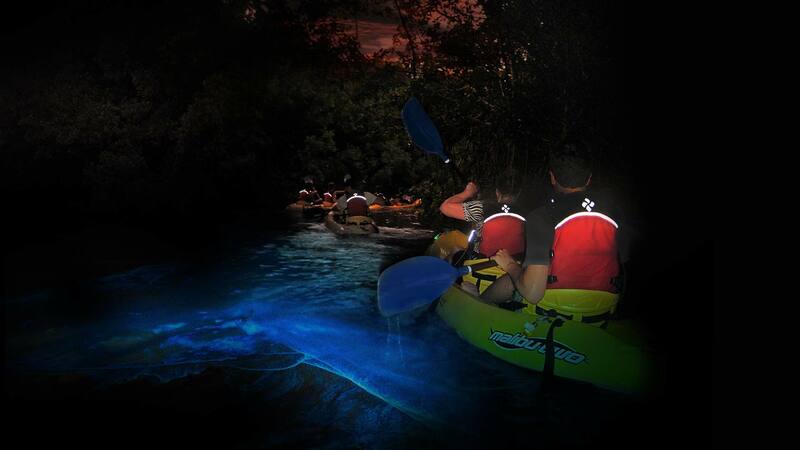 Discover bioluminescence at the Fajardo Bio Bay with Kayaking Puerto Rico. ©Pictures of El Yunque Rainforest by Fine Line Excursions. 2.5 to 3 hours to Eat, Shop, enjoy beach time & Chill. *The times in this schedule are approximations. Exact times may change by season. Please, contact us for more details. 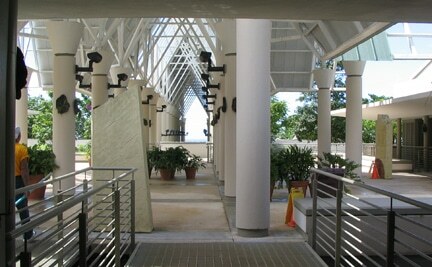 Our El Yunque National Forest Tour starts at El Portal Visitor Center. This is the Gateway to the Forest. Here, you can learn about the forest and get souvenirs. In this tour, you will explore 2 trails and hike through 3 different levels of the forest. Be aware that the hikes are considered moderate to strenuous. Therefore, guests should be in good physical health. The first hike is from El Portal to La Mina Falls. At La Mina, you will be able to take a refreshing splash! After La Mina, our next stop is the Yocahú Observation Tower. 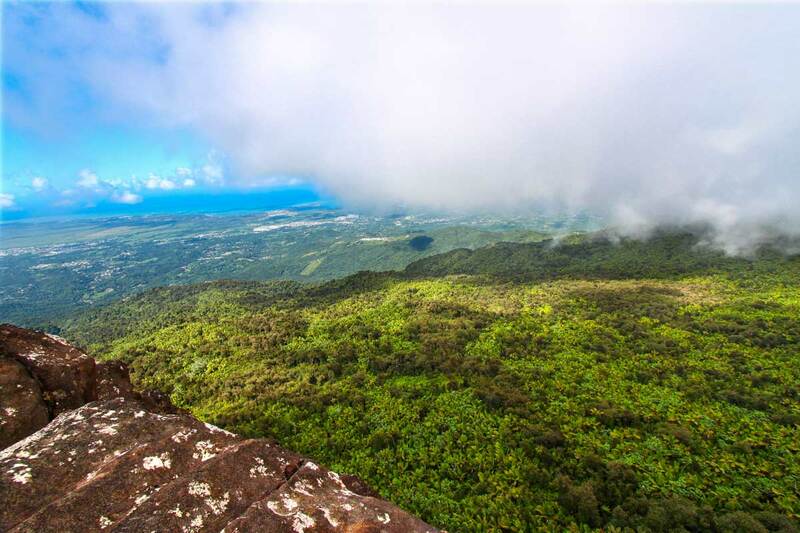 You will enjoy a 360° panoramic view of El Yunque Rainforest. Time to take those frame-worthy pictures! Finally, we stop at La Coca Falls. The Spanish conquerors used to call it The Fountain of Youth! DINNER STOP, PUERTO RICAN STYLE! After the rainforest tour, we head to a local restaurant for dinner. The selected restaurant may change by season. The menu is Puerto Rican cuisine and the prices are low to moderate. Average cost normally ranges from $12 to $14 per person. The meal and gratuities are NOT included in tour price. For your entrée you will have the choice of chicken, fish, steak or pork to go along with rice and beans, plantains, green salad and soft drink. Vegetarian meal option is available. Your tour guide will ask for the food order on the day of the tour. For more detailed information about the El Yunque National Forest Tour and the restaurant dinner stop, click on Fine Line Excursions. After dinner, our excursion continues to the Fajardo Bio Bay. Our Fajardo Bio Bay Kayak Tour begins at Las Croabas. First, our team will show you the basics of kayaking and safety. We will explain the rules of the nature reserve and board our kayaks. The ramp is accessible. The water is shallow. At this time on a regular day, the sunset looks great! The entrance of the Fajardo Bio Bay is a red mangrove channel. The mangrove forest is inside Las Cabezas de San Juan Nature Reserve. Along the way, you see its protected flora and fauna. It’s beautiful! Our eco guide will lead the way and explain the ecology of the place. The mangrove channel opens into the big lagoon: Laguna Grande. The sunset is on. The night will fall and stars will follow. In the sky… and in the water too. At every stroke of your paddle, lots of sparkles will appear in the water. All kayaks will create a swirl of light. The fish will glow in the darkness of the water. The place will turn magical! The intensity of the glow will depend on the phase of the moon. Little moonlight, brightest glow. But no matter how bright, it glows every day. The Fajardo Bio Bay is perfect for watching the stars too. We will show you the constellations in our sky. It’s like being inside a vault of lights. We will cruise back through the mangrove channel. At this time, night has set. Our eco-guide leads the expedition back. The kayak’s navigation lights show the way. In the darkness, the sounds of nature are exotic. The air is fresh. Snacks are ready at the tent. Let’s go on this adventure with Kayaking Puerto Rico! After the Fajardo Bio Bay Kayak Tour, your transportation will be ready to take you back to your hotel. For more detailed information about the Fajardo Bio Bay Kayak Tour, click here. The description above is intended to provide you a general idea of the tour itinerary. On rare occasions, we may be obliged to make minor changes to the schedule according to weather, seasons, and availabilities. Please contact us if you wish to receive more detailed information about any aspect of your tour. Enjoy the majestic views of El Yunque Rainforest. 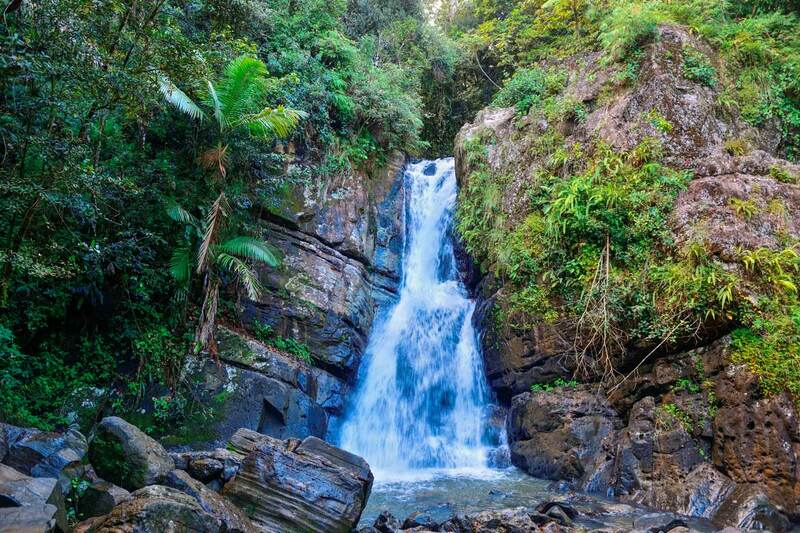 Visit the waterfalls of El Yunque Rainforest. 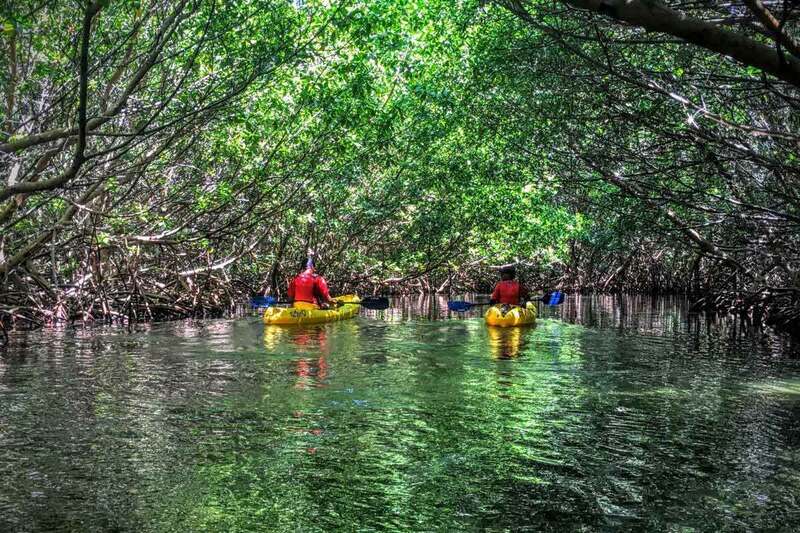 Go on a kayaking excursion to the Fajardo Bio Bay. Check-in time starts 30 minutes prior to departure, please arrive on time. The duration of the tour is 2 hours. Cash for restaurants, souvenirs, tips, etc. Please, notify us ahead of time if you have any physical condition. We require a minimum of 6 guests to provide the tour. We will notify you ahead f time if the minimum is not met. Need more info? Check our Frequently Asked Questions. The excursion to El Yunque Rainforest does not include free pictures. If you would like to have memories of your experience there, we recommend you to bring your camera. Our eco-guides will take photos of your experience with us in the Fajardo Bio Bay. These photos are free for you. We will upload them to Google Photos and send you a link. You will be able to download your favorites. We will use the email provided in your reservation. The pictures will be ready within 5-7 business days. This tour includes round trip transportation. The transportation service is scheduled directly with Kayaking Puerto Rico and provided by Fine Line Excursions. Depending on your location, you will receive a pre-assigned pickup point and approximated pickup time on your confirmation email. Pickup points include all hotels in San Juan, Carolina, and the east coast area. There is always a reason to go back to Kayaking Puerto Rico!!! As I have done it for the pass years… Its an adventure whether you know how to kayak or not!! Knowledgeable staff from reservations to kayaking guides!!!! Recommended highly. Five stars!!!!! This company is awesome. They are friendly, fun, knowledgeable and have a few goofballs. They provide snacks after the trip and a picture. Memories we will never forget, snorkeling with sea turtles, a great reef full of sea life, and the beautiful Flamenco Beach. Our whole family with kids 9-15 had an incredible time.